For experienced hillwalkers looking to add to their Munro tally, an expedition over the three summits that make up the Beinn a'Ghlo range, near Blair Atholl, is not to be missed. To savour a truly exceptional day, make sure the sun is shining and you should enjoy fine walking conditions and excellent views. Leave the car and follow the road over a cattle grid and along past Loch Moraig, a small tree-lined strip of water occupying a shallow bowl in the rolling open countryside above Blair Atholl. Pass through a gate and a wide track rises gently, running alongside open land where sheep, and sometimes cattle, graze contentedly. The area is alive with the fluttering of small birds in the spring and summer and the distinctive call of the lapwing can be heard echoing across the moor. The track runs on to cross a second cattle grid before curving left to reach a wooden shed. Leave the track at this point and cross a stile a few yards away to reach a larger hut. The path drops down to run out across open heather moor and there are a couple of boggy patches where short detours are sometimes required to keep feet dry. Carn Liath (975m) dominates the view ahead and the path meets up with a fallen down drystane wall as it begins the ascent proper. The climb is hard work but as height is gained fine views open out over the surrounding countryside. Towards the top, the route zigzags through an almost snow-like covering of white granite scree before flattening out across stony ground to reach a large cairn and, a short way on, the trig point marking the summit. 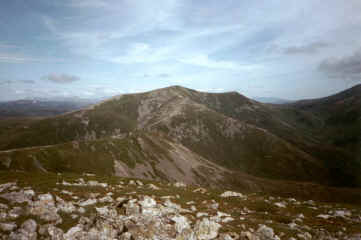 The peak's name translates from Gaelic as 'grey hill' and the scattering of stone on the summit approach most likely accounts for this christening. However, in the summer the hill takes on a bright purple hue as the heather bloom. Pause a while - there's a low stone shelter to keep the wind off - and admire the panoramas. 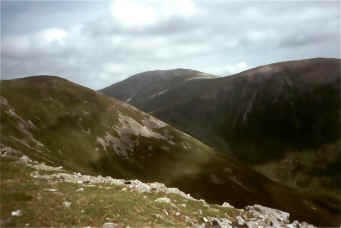 The route continues north from the top of Carn Liath, following the shoulder round to the outlying top of Beinn Mhaol before it descends into the col below Braigh Coire Chruinn-bhalgain (pictured right) at 1070m high. From here, prepare for another steep climb as the path rises over the stone-strewn hillside, heading east first before curving north to reach the summit, standing proud over Glen Tilt to the north west. The mountain's rather lengthy name means 'upland of the coire of the round blisters' but hopefully this is not a reference to foot problems as there is still one peak to go. The path descends into the next col where the ascent of Carn nan Gabhar begins. At 1129 metres, it is the highest of the trio. The rise is well graded and, once on the ridge, bear left to reach a cairn and, a little further on, a trig point. This is not the actual summit, which is marked by a cairn a short distance further north. The route down requires a short stretch of backtracking over the trig point and the cairn before it. Then head south along the ridge to the top of Airgiod Beinn. From there, a stony path descends over the southwest shoulder into the glen below. Take care to avoid any ankle injuries on the rough ground. At the bottom, cross the burn and, on the far side, a path skirts through the heather round the lower slope of Beinn Bheag. 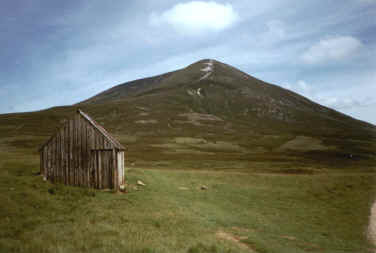 Continue over open ground to join the track below Carn Liath then follow this back to the start, passing by the wooden huts visited earlier in the day. Map OS Landranger sheet 43. Start End of the public road at Loch Moraig. GR: 905672. To reach by car, leave the main road in Blair Atholl on road signed 'Old Blair, Glenfender and Monzie'. At Bridge of Tilt, turn right, following sign for 'Glenfender and Monzie' and at the next junction, go right at sign for 'Monzie' and follow the road up to the loch. Parking Plenty of space at start. Grading Strenuous upland expedition for fit, experienced hillwalkers.